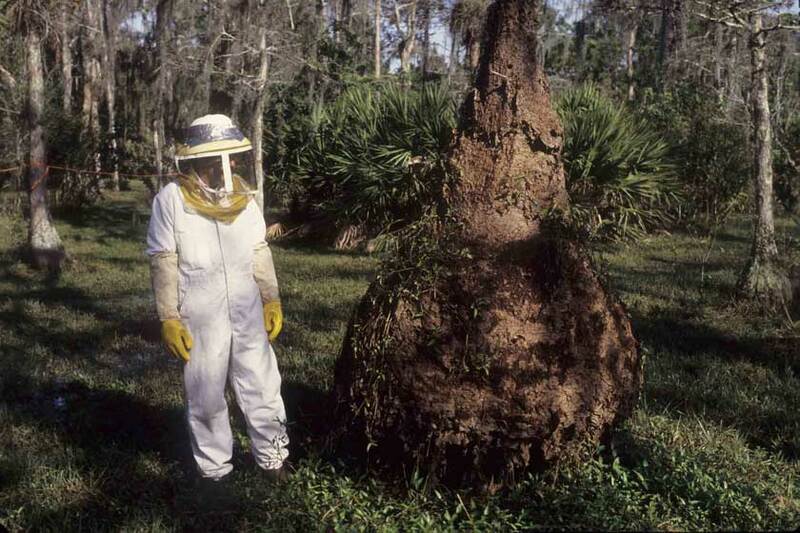 Dr. Castner has spent many hours in a ‘bee suit’ while eliminating large yellowjacket nests in the southeastern United States. This has been in association with his mentor, Dr. Gary Fritz. The yellowjacket wasps are removed from the nests alive, immediately frozen, and later used for research or pharmaceutical purposes. This service is provided free, but all liability for such an eradication operation remains with the property owner. Nests may be above ground or subterranean. In the Southeast, most nests are underground and usually have only one to several fairly small entrance holes in the ground surface. These holes typically have papery nest material (carton) surrounding them that is gray-white-tan in color. In an active nest the yellowjackets will be constantly flying in and out of these holes during daylight hours. Other nests constructed above ground may be in just about any place imaginable. Very large nests are typically seen built around the bases of trees, and can reach enormous and dangerous proportions, some as tall as eight feet. Do not approach or bother such nests in any way! If you have an active yellowjacket nest on your property, and would like Dr. Castner to examine it with the intent of removing it, be prepared to answer the following questions about the nest. Is the nest on your property? What is the closest distance to an electrical outlet that can be used during the nest removal process? Has the nest ever been treated with any chemicals? This is an adult worker or female of a common yellowjacket wasp found in the southeastern United States. The black and yellow markings are very distinctive. The workers aggressively defend their nests and are capable of stinging many times. 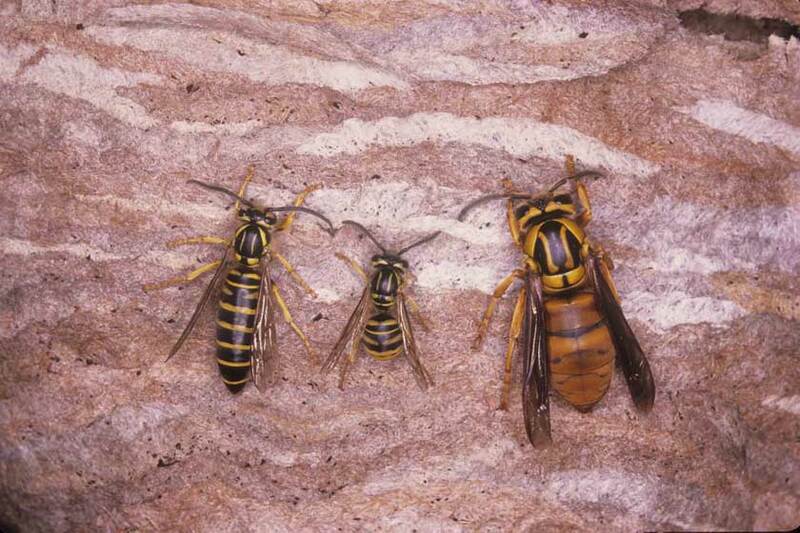 These are the three castes of wasps that may be found in any yellowjacket nest. On the far left is a male, in the center is a female or worker, and the large almost orange-colored individual on the far right is a queen. A nest may have multiple queens. 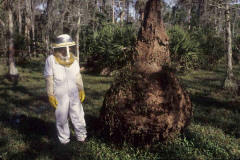 This photo gives you an idea of the immense size that some yellowjacket nests may reach when conditions are optimum. Such nests are often found constructed around the base of a tree. 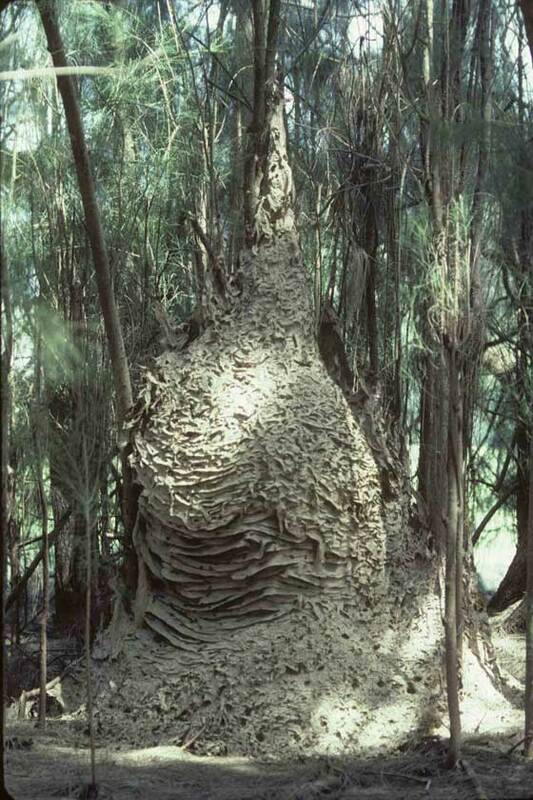 One of the largest nests encountered was this south Florida giant. It reached a height of eight feet and had a base that was 4’-5’ in diameter, including the tree trunk around which it was built. No yellowjacket nest should be disturbed or molested. 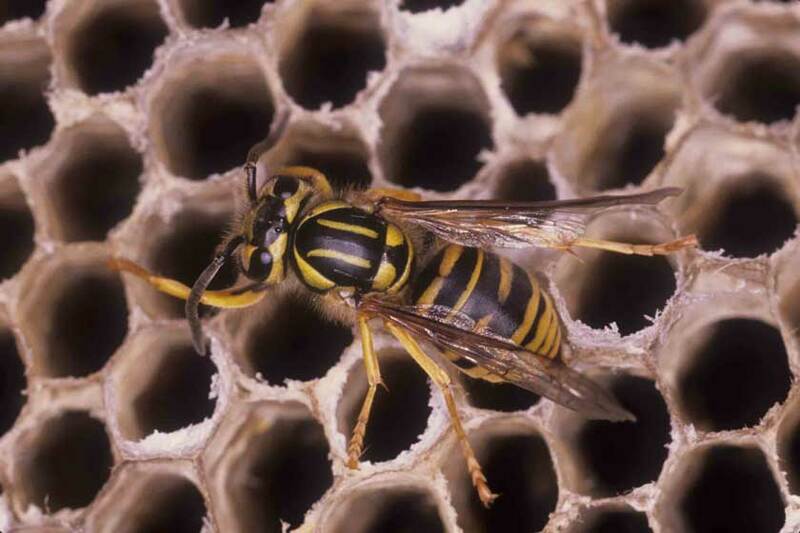 A nest of this size could easily contain over 200,000 adult wasps and presents a mortal danger to people and animals.